It keeps me focused and it’s always satisfying crossing off that last to do for the day then leaving the office feeling accomplished. Most people feel best about their work the week before their vacation, but it’s not because of the vacation itself. What do you do the last week before you leave on a big trip? You clean up, close up, clarify, and renegotiate all your agreements with yourself and others. I just suggest that you do this weekly instead of yearly.” –David Allen, Getting Things Done: The Art of Stress-Free Productivity. I highly recommend this read for anyone who wants to get the most out of their day. The main idea with Allen’s method rests on the idea of moving planned tasks and projects out of the mind by recording them externally and then breaking them into actionable work items. This allows one to focus attention on taking action on tasks, instead of on recalling them. CRM is a great system to aid with this. In my consulting travels I constantly see organisations with mediocre sales people (e.g. yours truly) turn into good sales people by simply staying on top of sales follow ups in a timely manner. You can see here a task list that is due for my user, showing only calls that are due Today and Prior. This is your to do list for today for sales calls. Track pending activities. List activities that need to be performed. Control the scope of these listings; they can be daily, weekly, or monthly. 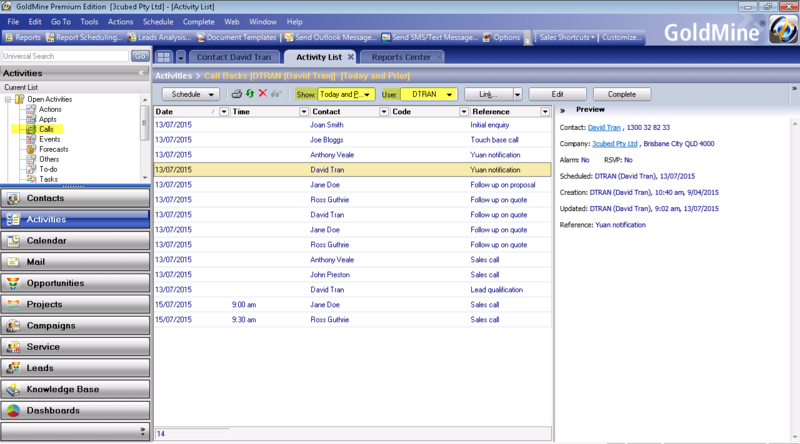 View activities pending for a contact or view only those calls that must be made on a specific day. Also view pending activities of other users. Set up reminders. Remind yourself about important activities. Alarms can be set for activities CRM supports. Record an electronic paper trail. When activities are completed, CRM maintains a record of what was done, when it was done, and by whom—providing powerful information for subsequent follow‐up with contacts. Schedule meetings. When your activities are scheduled in CRM, other CRM users can determine the times you are available for meetings, conference calls, or appointments. Delegate. Use the Calendar to assign scheduled activities to others and track their progress. Also useful when delegation can be completed in bulk in times of employee turnover and sales territory realignment. Link activities with your contacts. Create linked activities and unlinked activities. Linked activities associate with a contact record. Mobile access to a unified tasks list enables users to be timely reminded but also be able to complete actions in between appointments.